The long, sweeping branches and silvery gray leaves of the weeping willow tree (Salix babylonica) make it easy to recognize. Weeping willows grow tall, becoming the centerpiece of the landscape under ideal growing conditions. Follow willow tree maintenance guidelines to keep your tree looking great. Weeping willows are hardy in U.S. Department of Agriculture plant hardiness zones 4 through 9, although it may survive in USDA zone 10 with sufficient water. Weeping willows do well in both full-sun and partially shaded areas. Avoid planting other trees near it if they will completely block the willow's sunlight when they are mature. Trees and buildings should be at least 30 feet from the weeping willow. Because a weeping willow's brittle branches break off easily in windy areas, installing a fence or windbreak may be necessary if wind is an issue in your location. Weeping willows tolerate almost any kind of soil that doesn't dry out quickly. The tree reaches 30 to 40 feet tall, and its canopy is equally wide, so it isn't suitable for a small lawn. It has a shallow but very large root system that can invade water and septic system lines. Between the massive root system and the branches hanging down to the ground, a willow tree can take over a yard quickly. Grass and other plants grow poorly beneath a weeping willow's arching branches, but laying a 2- to 4-inch-thick layer of mulch on the soil surface below the tree helps prevent soil moisture loss. Leave a 3- to 4-inch space between the trunk and the mulch. Water your weeping willow regularly during dry weather if it isn't near a pond, creek or other consistent water source. Keeping the soil moist, but not soggy, at all times results in the tree's best growth. A mature weeping willow doesn't require fertilizer if it is in rich soil and its leaves are a healthy green or nearby lawns are fertilized regularly. Otherwise, 1 pound of nitrogen per 100 square feet of ground can be applied beneath the willow's canopy in early spring and midsummer. For example, use 6 1/2 pounds of 15-5-10 granular fertilizer for a mature tree with a canopy spread of 1,000 square feet, or use 3.3 pounds of the fertilizer for a younger tree with only a 500-square-foot canopy. Sprinkle the fertilizer evenly on top of the soil, starting 1 foot from the tree's trunk and ending at the tree's drip line, which is the outer edge of its canopy. Water the site thoroughly so the fertilizer begins to dissolve and soak into the ground. People and pets should stay out of the fertilized area until the granules dissolve. Part of weeping willow tree care is cleaning up the branches. The long, draping weeping willow branches require annual pruning to keep them off the ground. Cut back the branches to the desired length with pruning shears in late winter or early spring. Prune out damaged branches any time. Disinfecting pruning shears before pruning and after trimming diseased wood prevents the spread of plant diseases and pests. Wiping the pruning shears with a cloth that was soaked in isopropyl alcohol disinfects them. Weeping willows shed a lot, necessitating regular cleanup. Fallen leaves, whiplike branches and catkins are the common debris. Rake under the tree regularly to remove the debris. Various diseases can affect the weeping willow. Willow scab, which is a fungus, kills young leaves and produces green spores on the underside of foliage. When willow scab combines with the fungus Physalospora miyabeana, the resulting disease is called willow blight. Canker diseases that leave lesions on foliage and stems are also common in weeping willow. Pruning out the infected branches and removing the tree if the infection moves into its trunk are the best control options for the cankers, willow blight and willow scab. Powdery mildew, rust and tar spot affect the foliage. These willow tree diseases are rarely a cause for concern. Pruning out badly infected branches combined with regular raking and disposal of fallen debris from the tree minimizes those diseases. The most deadly disease, crown gall, results in gall growths on the trunk near the ground or higher. A tree infected with crown gall requires immediate removal. Don't replant in that area for two years to prevent additional infections. 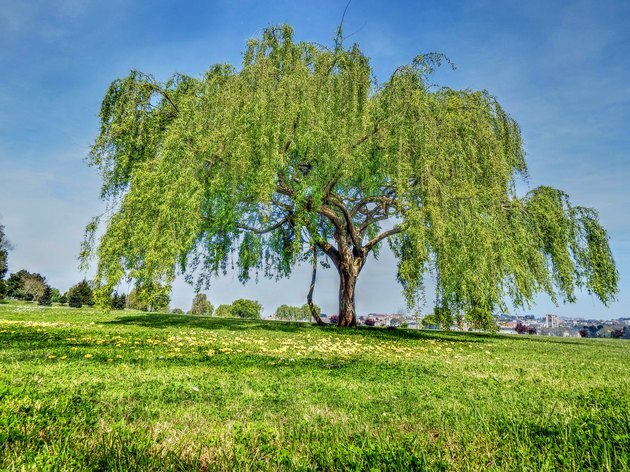 Most weeping willow pests cause minimal damage and don't require control unless heavy populations visibly weaken the tree or begin spreading a disease. Aphids, which are small, pear-shaped insects that feed on the underside of foliage, leave behind sticky honeydew and can spread disease to a willow tree. Spraying the foliage with a hard jet of water and pruning out badly infested leaves helps control the aphid population. Scale insects resemble bumpy growths on leaves and branches. They can weaken a willow or spread fungal diseases as they feed on sap. Pruning wood badly infested with scales is the most dependable control method. Roundhead borers can cause the most damage. They create round holes in the trunk, often near its base. Keep the trunk free of mulch and fallen leaves. If borer holes are present, force a long wire into each hole to kill the pests. With regular care, your weeping willow grows into a thriving centerpiece in your large yard. Ample water and regular pruning play a central role in the care of this draping tree.